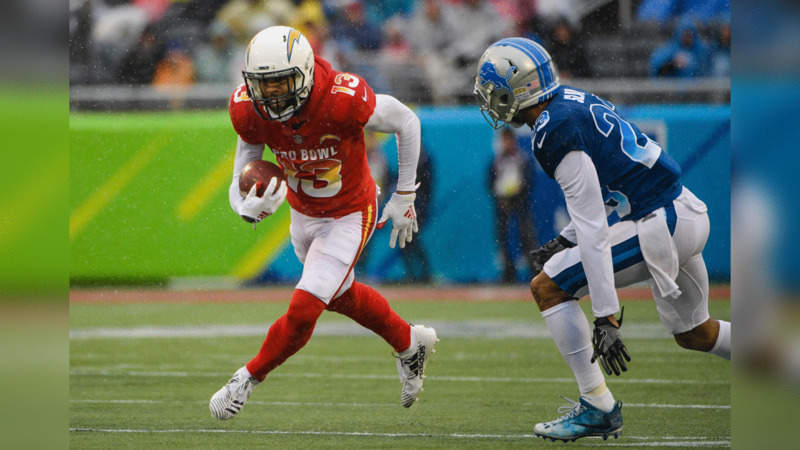 Keenan Allen runs with the ball during the first half of the 2019 Pro Bowl on Sunday, Jan. 27, 2019, in Orlando, FL. Keenan Allen runs with the ball after a catch during the 2019 Pro Bowl, Sunday, Jan. 27, 2019 in Orlando, FL. Colts TE Eric Ebron celebrates his touchdown with Keenan Allen and Jets WR Andre Roberts during the first half of the 2019 Pro Bowl on Sunday, Jan. 27, 2019, in Orlando, FL. Derwin James smiles during the first half of the 2019 Pro Bowl on Sunday, Jan. 27, 2019, in Orlando, FL. Melvin Ingram sacks Seahawks QB Russell Wilson during the first half of the 2019 Pro Bowl on Sunday, Jan. 27, 2019, in Orlando, FL. Keenan Allen runs with the ball after a catch during the 2019 Pro Bowl on Sunday, Jan. 27, 2019 in Orlando, FL. Melvin Gordon looks toward the sideline during the 2019 Pro Bowl on Sunday, Jan. 27, 2019, in Orlando, FL. Head coach Anthony Lynn looks on during the first half of the 2019 Pro Bowl on Sunday, Jan. 27, 2019, in Orlando, FL. Adrian Phillips during the first half of the 2019 Pro Bowl on Sunday, Jan. 27, 2019, in Orlando, FL. Keenan Allen lines up for the snap during the 2019 Pro Bowl on Sunday, Jan. 27, 2019, in Orlando, FL. Mike Pouncey walks onto the field during the first half of the 2019 Pro Bowl on Sunday, Jan. 27, 2019, in Orlando, FL. Keenan Allen leaps for a catch during the second half of the 2019 Pro Bowl on Sunday, Jan. 27, 2019, in Orlando, FL. Colts QB Andrew Luck and Melvin Gordan run onto the field during the 2019 Pro Bowl on Sunday, Jan. 27, 2019, in Orlando, FL. Melvin Gordon celebrates during the second half of the 2019 Pro Bowl on Sunday, Jan. 27, 2019, in Orlando, FL. Chiefs running back Anthony Sherman celebrates with Melvin Gordon after scoring against the NFC during the first half of the 2019 Pro Bowl on Sunday, Jan. 27, 2019, in Orlando, FL. Melvin Gordon and Chiefs QB Patrick Mahomes signal a touchdown during the 2019 Pro Bowl on Sunday, Jan. 27, 2019, in Orlando, FL. Melvin Ingram celebrates with Broncos LB Von Miller during the second half of the 2019 Pro Bowl on Sunday, Jan. 27, 2019, in Orlando, FL. Derwin James smiles during the second half of the NFL Pro Bowl football game Sunday, Jan. 27, 2019, in Orlando, FL. Jets safety Jamal Adams celebrates with Derwin James after the AFC defeated the NFC during the 2019 Pro Bowl on Sunday, Jan. 27, 2019, in Orlando, FL.